CD49d is the integrin α4 chain that non-covalently pairs with CD29 (β1 chain) to form the very late activation antigen 4 (VLA-4), or with the integrin β7 chain. CD49d is a transmembrane glycoprotein of 145 kDa devoid of disulfide bond. Complexed to β1 or β7 integrins, CD49d is not only involved in cell adhesion to fibronectin and vascular cell adhesion molecule 1 (VCAM-1), but also in intercellular leucocyte interactions. It is expressed by monocytes, lymphocytes, eosinophils, thymocytes and Langerhans cells. *Alexa Fluor and Pacific Blue are registered trademarks of Molecular Probes, Inc.
Clone Description The HP2/1 antibody blocks the interaction of VLA-4 with VCAM-1. 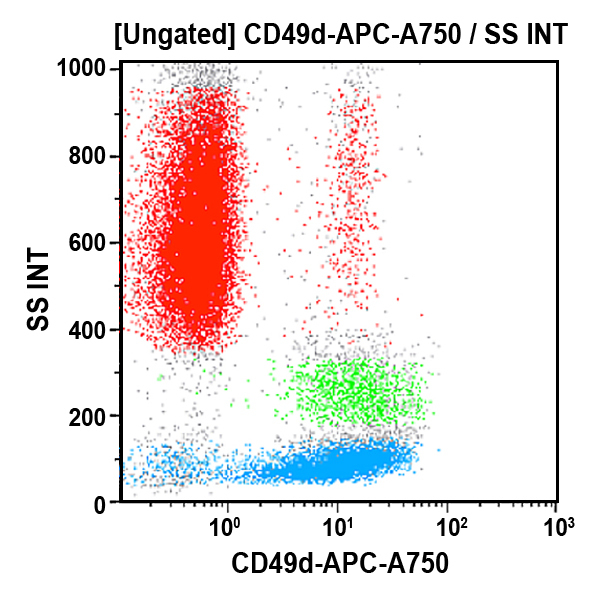 HP2/1 was used as a CD49d reference monoclonal antibody during the HLDA 6.